Over the past year, we’ve posted a dozen commentaries about the UBS Puerto Rican closed end bond funds to our blog post here. In Taxes, Puerto Rico Municipal Bonds and the UBS Funds we show that preferential tax treatment for Puerto Rican investments cannot justify what would otherwise be unsuitable concentrations of investors’ portfolios in Puerto Rico municipal bonds. We focused our attention in that post on mainland municipal bond alternatives to Puerto Rican municipal bonds and showed that even though Puerto Rican residents would pay taxes on the mainland bonds, the risk adjusted returns on the mainland municipal bonds were still higher than on the Puerto Rican municipal bonds. Of course, investors should consider the after tax risk and return possibilities in taxable portfolios when considering whether to invest in municipal bonds. We expand our prior comparison of Puerto Rican municipal bonds by demonstrating where on the risk-return tradeoff, leveraged portfolios of Puerto Rican municipal bonds would fall. In Figure 1, we plot the annualized total returns to diversified portfolios of stocks and bonds ranging from 100% bonds to 100% stocks. Total returns are calculated using monthly returns from January 2003 through December 2012. We use the Vanguard S&P 500 Index fund (VFINX), and the Vanguard Total Bond Market Fund (VBMFX) to reflect the pre-tax returns investors earned during this 10 year period in taxable investments. We also plot the risk and return of the unleveraged S&P Puerto Rican municipal bond index and the risk and return of the prototype UBS Puerto Rico closed end fund in Figure 1. There is not enough trading in the UBS PR funds and the prices UBS set on the funds was unchanged for weeks at a time so we cannot estimate the true risk of the UBS Puerto Rican Funds. The UBS closed end funds were leveraged 2:1. So if the Funds’ portfolios matched the S&P Puerto Rican Index they would have been twice risky as the S&P PR Index. In fact, the UBS Puerto Rican Funds had more of a barbell shaped risk profile with roughly 1/3 of the portfolios in lower risk agency bonds and over 1/3 of the portfolio in much higher risk ERS bonds after 2007. Given the UBS PR Funds fell by more than twice the decline in the S&P Puerto Rican Index in 2013 it appears our estimate of the true risk of the UBS Puerto Rican Bond Funds is fairly accurate. 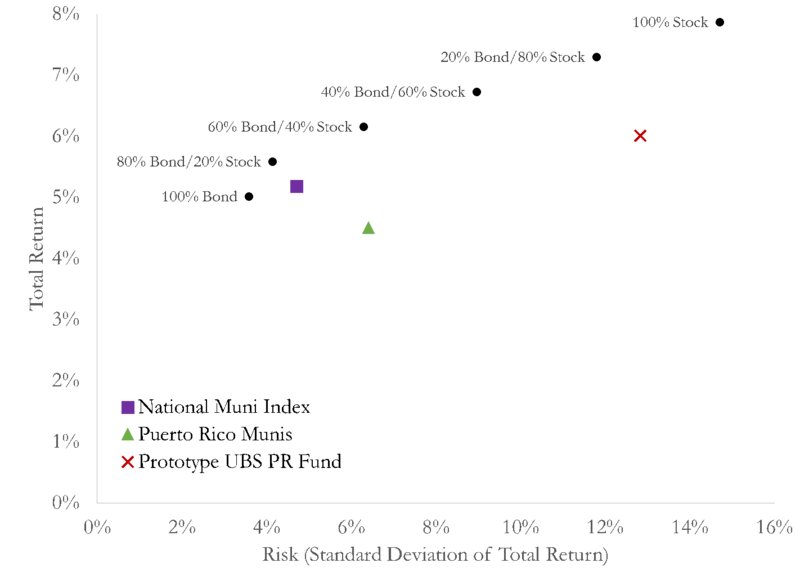 We can see in Figure 1 that on a pre-tax basis, the UBS Puerto Rican Funds fall well below the “efficient frontier.” If Puerto Rican municipal bonds received the same tax treatment as the stocks and taxable bonds plotted in Figure 1, no rational or informed investors should buy the UBS Funds because the investors could achieve the same returns with lower risk or higher returns at lower risk. We estimate that, on a pre-tax basis, the UBS Puerto Rican Bonds Funds have the risk of a portfolio invested 85% in stock and 15% in bonds. Puerto Rican residents did not pay income taxes on Puerto Rican municipal bond income but would have paid taxes on interest and capital gains paid on the stock and bond portfolios plotted in Figure 1. We adjust for this difference in tax treatment by reducing interest distributions by 33% and capital gains by 10% paid by the stock and bond portfolios. 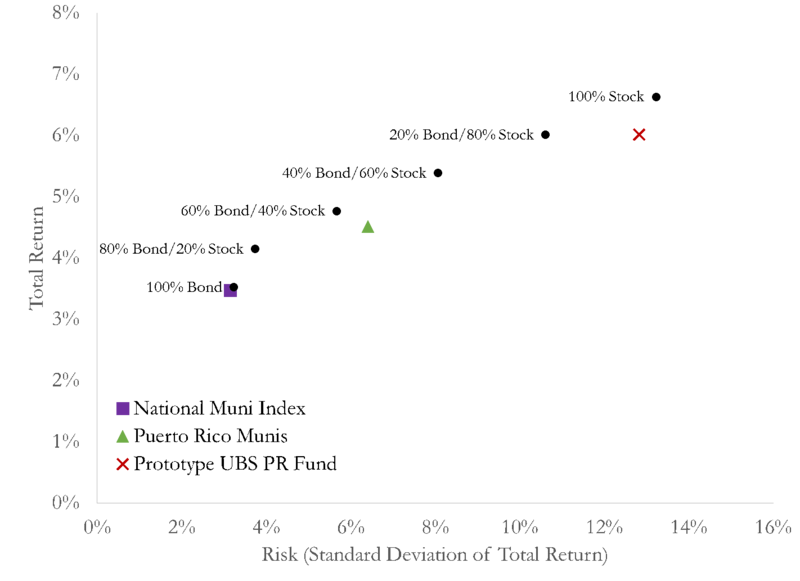 Figure 2 plots the after-tax risk and returns.